A unit expressing the concentration of ozone in the Earth's atmosphere over a specified area. Symbol, DU. It is named for G. M. B. Dobson (1889 – 1976). Imagine that all the ozone in a column reaching from an area on the Earth's surface to the top of the atmosphere were concentrated in a single layer of pure ozone at a temperature of 0°C and a pressure of 1 standard atmosphere. The thickness of that layer, measured in hundredths of a millimeter, would be the concentration of ozone expressed in Dobson Units.¹ One Dobson Unit is equivalent to about 2.69 × 10¹⁶ ozone molecules in a column with a cross section of 1 square centimeter. 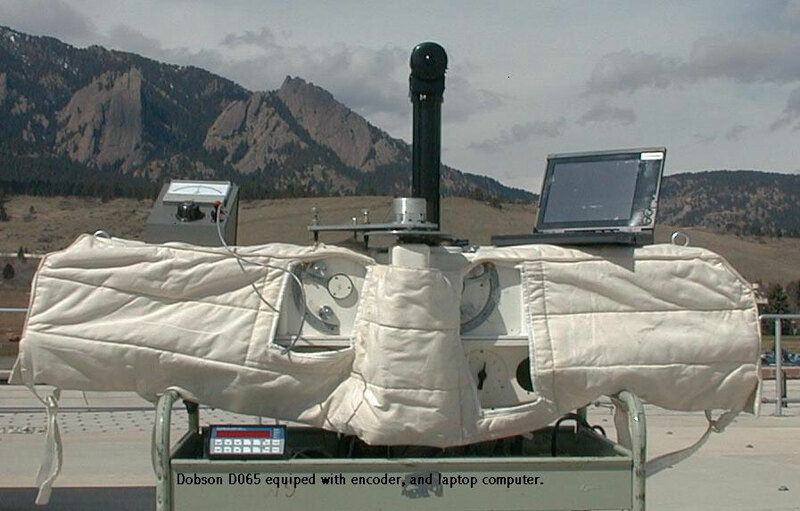 The instrument that measures ozone concentrations in Dobson units is called the Dobson spectrophotometer. It works by measuring the intensity of sunlight at two wavelengths that are absorbed by ozone, and two that aren't. The lowest ozone concentration measured before 1996 was 85 Dobson Units, measured by a Total Ozone Mapping Spectrometer on a Russian satellite over Antarctica in 1993. A balloon flown from the U.S. research station at the South Pole measured 90 Dobson Units on October 6, 1993. NASA's Total Ozone Mapping Spectrometers (TOMS) and its successor, the Ozone Mapping Instrument (OMI) are satellite-borne spectrophotometers that measure ozone concentrations over most of the earth. The Dobson unit is occasionally used to express concentrations of other atmospheric gases, such as methane. 1. G. M. B. Dobson. Forty year's research on atmospheric ozone at Oxford. Applied Optics, volume 7, pages 387–405 (1968). Adjustment and calibration of ozone spectrophotometers. Annals of the International Geophysical Year, V, Part 1, pages 90-113. Last revised: 3 February 2017.